After a 10-day tour of African nations, Chinese leader Xi Jinping returned to Beijing to immediately convene a political meeting. On July 31, two days after returning to China, Xi hosted a meeting with the Politburo, a 25-member group of Chinese Communist Party elite. State media reports about the meeting’s topics of discussion provided hints that Xi needed to demonstrate Party support for his rule, amid criticism that he has not handled well the U.S.–China trade disputes. China political commentator Shi Shi noted that this insinuates the Party leadership was concerned about two key issues: the challenges presented by the trade war, and the subsequent threats to the Beijing leadership. “Because the Politburo is emphasizing upholding ‘Xi as core of the Party,’ that indicates there are Party officials who are not wholeheartedly behind Xi,” he said. The Chinese economy has taken a hit since U.S. tariffs went into effect in early July. The yuan has depreciated and stocks have fallen amid investor anxieties, while foreign manufacturers are leaving the country in order to avoid U.S. tariffs from cutting into their profits. This hasn’t looked good for the Xi leadership. 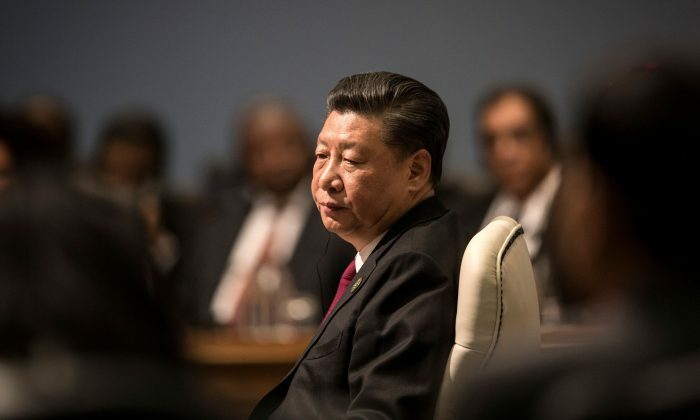 In recent weeks, China observers have noticed a pattern of events suggesting that the Party leadership is displeased with the way Xi has handled the trade war, including unusual omissions of Xi’s name from the front page of the Party mouthpiece, People’s Daily, and a protester’s public disavowal of “authoritarian rule” being allowed to spread on the internet (albeit briefly, as posts on the statement were later censored). Shi said the Politburo meeting and its emphasis on maintaining Xi’s leadership were tacit proof that those rumors were true. This week, other dissenting posts criticizing China’s economic policies have also begun circulating on the internet. One by Chinese economist Xu Xiaonian, from a speech he gave in early July at an economic forum, analyzed how the Chinese regime has sought to attract foreign investment yet failed to establish internal sustainable growth. Another by Xu Zhangrun, a professor at Tsinghua University’s law school, was more direct with his criticism, calling for the reinstatement of term limits for the position of state chairman (Xi formally abolished term limits in March), political rehabilitation for those involved in June 4 democracy protests, and granting citizens the right to own private property (currently, all land belongs to the state and is leased to developers or citizens). As U.S. President Donald Trump escalates the trade dispute with talks of raising tariffs from 10 percent to 25 percent on $200 billion worth of Chinese goods, trade woes are expected to be a major political problem for the Beijing leadership. Top officials are expected to soon hold the annual Beidaihe seaside meeting in August, and at the top of the agenda will be discussing “major errors” committed, according to an Apple Daily report on July 14. Former Chinese senior military officer and princeling Luo Yu told Radio Free Asia in a July 20 interview that he predicts the U.S.–China trade war will be a key topic of discussion at Beidaihe, adding that he believes the recent online criticisms were allowed to circulate because some top officials wished it would be a segue into discussing the leadership’s mistakes during Beidaihe.